When viewing the achievements dialog on non-responsive pages (like the review queue detail pages) in Safari on an iPhone, the alignment is off: reputation changes take more horizontal space than badges. Also, the badges align to the bottom of the row instead of the top. I am not sure if all pages will eventually get the responsive treatment; if they do, it's probably not worth the effort to solve it. 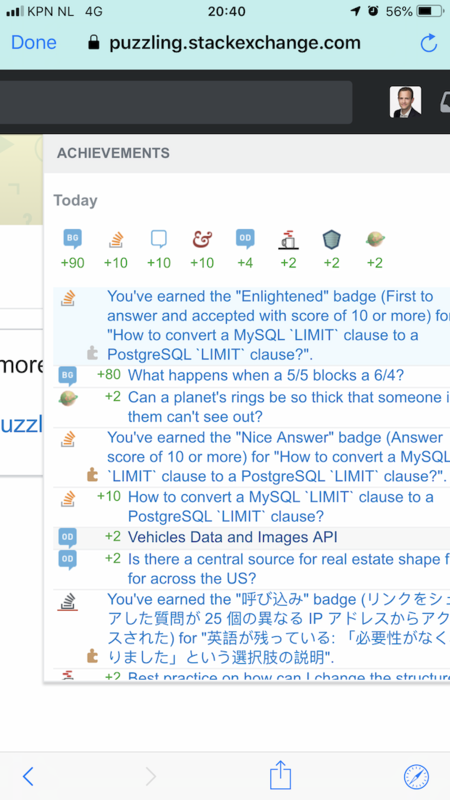 Browse other questions tagged bug design achievements-dialog . Can we please have the badge colors in the achievements dialog on mobile theme? How to hide the “+2” in my achievements dialog button when I accept an answer?